Christmas is over with, at least for another year. Not that I am against celebrating the joyous season. I think the only ones in the world that truly have the right to celebrate Christmas are Christians. I don't mind it if the markets happen to say "Season's Greetings" or "Happy Holidays" because that is a reflection of how the world approaches a Christian Holy-day. I say "Merry Christmas" because I want a mighty celebration of the birth of our Lord and Savior Jesus Christ. His birth was a significant event, it marks the beginning of the "enfleshment" of Deity, the incarnation of the eternal Son of God. It marks the beginning of God's plan of the redemption of fallen man. It is not just a doctrine to know, but a miracle to behold and rejoice over. And so what now? The Bible tells us some thirty years after the birth of Christ about another prophecy being fulfilled. This one is about John the Baptist. He is known as the voice crying in the wilderness. He wasn't weeping, he was preaching. And it was a loud style of preaching. He had an important message, and it is one of repentance. It wasn't (and still isn't) a popular message, but the Baptist preacher isn't one for pop-preaching, like so many who act like preachers, but have nothing to say (at least nothing authoritative to say). He is The Voice. He was trying to get people's attention to point them to the kingdom of heaven. He tried to point as many people as would hear his message about Jesus Christ. We know that Jesus is the Word (John 1:1, 14; Rev. 19:13). The German theologian Eric Sauer used the metaphor of the voice and the word. He pointed out how that the word in and of its own is self-sufficient, and has inherent meaning, it can stand alone. However the voice without understandable words is nothing but noise. What made John the Baptist great was not himself, but God. It was God who called him, and ordained him to be the fore-runner of Christ, to announce to world the Gospel message of repentance from self and sin. Think about how much like John the Baptist we are as Christians. We have been saved by grace through faith. We are nothing without Christ. Our voices are meaningless, unless we speak about the Word. God is still God, and the message of repentance from self and sin hasn't changed, the kingdom of heaven is still "at hand." Christ is still coming to the clouds one day (the Rapture), and then finally to the earth (the Revelation). 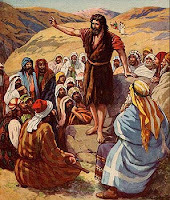 May we apply the attitude of John the Baptist and lift our voices and call sinners to repentance. Point them to Jesus through the written Word of God. If God can use The Voice, he can and will use our voices, if we would just allow Him to use our voices. After all, He has already supplied the Word.